Villa with private pool in Denia, on the Costa Blanca, Spain for 6 persons. 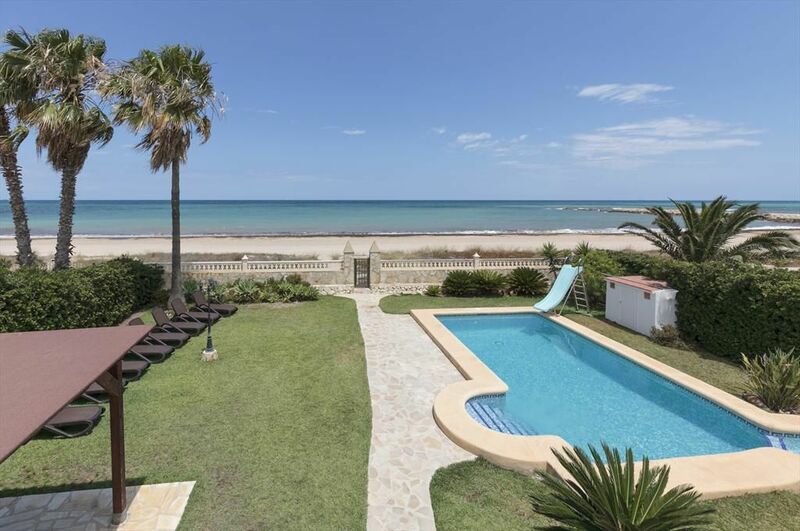 The villa is situated in a residential beach area and at 25 m from Almadrava beach. The villa has 3 bedrooms and 4 bathrooms, spread over 2 levels. The accommodation offers privacy, a wonderful lawned garden with gravel and trees, a wonderful pool and wonderful views of the beach, the sea and the mountains. Its comfort and the vicinity of the beach, places to shop, sports activities and places to go out make this a fine villa to celebrate your holidays with family or friends. Villa was very nice and clean, exactly like in the pictures! The best part of it was, naturally, the yard/garden with pool, sunbeds, outdoor dining table and the view at the sea/beach. It was just perfect for our family vacation! Wir haben uns in der Villa Neptun sehr wohl gefühlt. Es ist für mich unklar was gemeint wird ! Bitte genauer erklären ! Ein wunderschönes Haus mit tollem Garten in einer perfekten Lage direkt am Meer / Strand. Grandiose Aussicht direkt aufs Meer. Wer sich nicht an der kargen Umgebung stört und in Ruhe das Meer, den Strand und Pool genießen will, kann hier voll entspannen. Innenausstattung ist soweit ok. Alles für den täglichen Bedarf vorhanden. Aber das ist nebensächlich, da sich das Leben in diesem Haus hauptsächlich im Garten, am Pool oder am Strand abspielt. Denia is a sundrenched popular harbour city with a small-town feel to it, located at the Costa Blanca in the Comunidad Valenciana in Spain, at the north coast of Alicante province straight across the island of Ibiza which can be reached by the ferries from Denia´s port. Denia is the capital of the Marina Alta district. Valencia and Alicante airports are both approximately 100 km away from Denia. Denia has a beautiful marina and a medieval castle with view on the city and the sea. Denia offers different residential areas where you can find luxury holiday rentals: villas, houses and apartments. Denia covers a surface of 66.2 square kilometres and has a magnificently long beach-covered coastline, an impressive 20 kilometres in length, starting in Las Marinas (or Les Marines) and ending at Las Rotas (or Les Rotes). Denia counts four distinct areas: Las Rotas with its fabulous rocky coast, natural reserve Montgó, Las Marinas with its miles of beaches, and the centre of Denia. The following villages are also part of the Denia district: La Jara (a village just north of Denia ), Jesús Pobre (a village west of Denia , behind the mountain of Montgó ) and La Pedrera (situated against the slopes of mt. Montgó). While grape lice caused a major economical and demographical downfall at the beginning of the 20th century (also known as the raisin crisis), the touristic boom of the 60's had just the opposite effect, causing a demographical and economical turnaround. Population figures rose from 12.185 inhabitants in 1960 to 30.693 in 2000 and 41.591 in 2006. Midway through 2007, the number of inhabitants had already risen to nearly 45.000! From 1960 onwards, tourism has become the main economic engine of Denia while industries are disappearing and urbanization on the fast track. Since then, Denia has also developed into an important city and port area for its neighbourhood and the Costa Blanca . Besides being an important regional fishing port, Denia has two marinas and is point of departure for boats leaving for the Balearic Islands of Ibiza, Mallorca, and Menorca . When the Romans discovered Denia in the 3rd century B.C., Denia 's city adventure took off. The story goes that Denia was named after the Roman Diana temple, which was discovered there. An embedded stone from this temple can still be seen today in the Renaissance facade of the city. In centuries past, several cultures have influenced Denia : Iberians, Romans, Muslims, and Christians all inhabited the city and up to this day their influences can still be seen and felt in museums, monuments, and archaeological remains. A walk through the narrow lanes of the fisherman's district reveals the history, culture, and architecture of the Iberian, Carthaginian (North-African), Roman, Arabic, and Christian civilizations. The city is characterised by the Castillo, an ancient castle built by the troops during Muslim era (Muslims took over the stronghold from the Romans in 713) and fortified at the time of the independence war. It is a beautiful cultural heritage that can be admired from several places in town. Within its walls it houses the archaeological museum displaying the city's history from 200 before Christ until the more recent 18th century. Denia became a dukedom during the 15th century. The fifth Duke, The Duke of Lerma was favoured by king Philip III who declared Denia a city in 1612. Denia is surrounded by nature areas of high ecological value. The nature area of mount Montgó was named a nature reserve in 1987 because of its scenic value, flora and fauna. The area is home to a large diversity of original domestic plants, animals, caves and paths. Mount Montgó, reaching 753 meters in height, stretches out to the ocean at the impressive Cabo de San Antonio, a 160m high cliff with a lighthouse offering a stunning view over the sea and Jvea bay. At daytime this offers an impressive panorama while at night the many small lights grant the scene a touch of magic. At the foot of this cliff lies the Reserva Marina of Cabo de San Antonio natural reserve. This protected area has always remained well-preserved, making it of high value both environmentally-scientific and ecologically. Denia has more than 300 days of sunshine per year and with its average temperature of 20 degrees, Denia , with its 20 kilometre-long sand beach, makes for the ideal place to celebrate your holidays on the Costa Blanca. The beautiful long coastline of Denia is made up of outstretched sand beaches and rocky bays. In the north of the district lies the area named Las Marinas where you will mainly find long beaches with soft sand. Las Rotas is In the south of the Denia district. This area starts off with a sand beach, followed by a gorgeous rocky coastline with many bays and inlets offering scuba divers and snorkeling fans stunning underwater landscapes. Besides enjoying the sun, the beaches of Denia also offer all kinds of activities such as beach volleyball, soccer, surfing and kite surfing, jet skiing, canoeing, and scuba diving. If after all of these activities you would like to quench your thirst, please find one of the chiringuitos, the little wooden beach huts 'on' the beach, near you. The beaches of Denia are all popular family beaches and have received the European blue flag for their quality and neatness. Lifeguards protect the beaches during the summer months and the beaches are equipped with showers, beach loungers and beach umbrellas (usually available for a fee). The beaches also have several areas specially equipped for people with disabilities with amongst others special access paths to the beach and summertime transportation and supportive equipment for on the beach and in the sea. At Las Marinas these areas are found on the beaches of Punta del Raser and Els Molins, and at Las Rotas this is at Marineta Cassiana. Sights of Denia Castillo de Denia The old town section of Denia is dominated by the castle. Situated on a hill near the sea and at the heart of the town centre it is one of the characteristic features of its history. The original design stems from the 11th and 12th centuries, and it has undergone several architectural changes since. Its bastions, for instance, were built in the Renaissance style of the 16th/17th century. Remnants of three distinct era's can still be admired at Denia 's castle: Roman era: remainders from this period can be found at the east side of the castle (Torre del Galliner). Muslim era: This period can be observed at the Portal de la Vila (access gate) and at the arcs and roofs of the Portal del Baluart and the Torre del Mig. Christian era: This period is reflected in the Vila Vella, the walled city area that remained the city centre until the time of the Guerra de Sucesin at the start of the 18th century. A beautiful building because of its classical design and shapes. Its faade consists of six massive arches and big windows. The sea and the beach offer you the possibilities to go sailing, surfing, snorkelling, scuba diving, sea fishing, outings to the Balearic Islands , and to taste a multitude of culinary fish dishes. The coastline and inlands offer possibilities for a game of golf or tennis, to go hiking, biking, or horseback riding, or set out for a car trip to cultural and historical sights. Natures beauty invites you for a tour on foot, by bike or by car. There are many formidable hiking trails with routes of different lengths and varying in difficulty. You will walk through shadowy orange plantations or you can walk to the top of mount Montgó where the real reward is the unforgettable view of the surroundings. In this area, nature blossoms four seasons a year. A number of ferries set out from Denia harbour to the Balearic Islands. One of the possibilities is an excursion to Mallorca or Ibiza , with ferries going there every day. Denia offers everything you would want on a shopping day. The main street Marqués de Campo and the many little lanes offer a wide range of shoe, clothes, and jewellery stores. The market places of Denia are also worth your while. Offering a large diversity of local products ranging from fruits and vegetables from the surroundings, to freshly caught fish and even handicraft artworks. Since relaxing is important during your holidays, why don't you try out one of Denia 's many spa's on offer. Pick your choose from a wide range of treatments such as hydrotherapy, clay, algae, lavender, and/or camomile baths, massages, aromatherapy, reflexology, and many many more. characterised by dance and music, fireworks, and displaying major pieces of art, in the making for the entire year, that are ultimately sacrificed in the bonfire on the last evening of the celebration. This feast is celebrated in July and is mostly characterised by Bous al Mar (literally: Bulls to the Sea), in which the bulls are unleashed in the streets and startled by local Spanish daredevils trying to drive them into the sea. Spaniards love this feast, but animal lovers may best take a detour on that day. The days before and after are filled with many activities, reaching a climax with the Correfoc, a parade with beautiful floats. is a feast based on the historical-religious tradition and is celebrated throughout most of the Costa Blanca. It reminds of the times when Mores were occupying most of the Iberian Peninsula and the Christians reconquered it during the 'Reconquista'. This feast is truly a dress-up party with Moors, Christians, music, parades with horses and lots of spectacle. In Denia you can enjoy a large variety of seafood. The harbour of Denia has a daily supply from fishermen providing for the menu of the restaurants on the very same day. Furthermore you will find the typical dishes of the Costa Blanca of which the Paella is a must. The rich variety of the cuisine in this area of the Mediterranean Coast is mainly characterised by the use of olive oil, garlic, fish, crustaceans and fresh vegetables. Wellknown are also the renowned red shrimps of Denia, the rice dish calles Arroz a banda, the Espencat (grilled vegetables) and the Suquet de peix (with a.o. fish, sea urchins and dried cuttlefish). You can enjoy this delicious dishes in the more 300 Denia restaurants. Apart from that Denia has numerous cheerful terraces, bars and bodegas. Denia's location in between the sea and mountains offers an optimal surrounding for many different sports. Add to this the gentle and warm sea climate and one can practice a variety of sports on land or at sea all year long. This area has many golf courses; fourteen in total in the Alicante and Valencia districts. The nearest golf courses are the 18-hole lane of La Sella Club de Golf in Denia , the 18-hole lane of Oliva Nova Campo de Golf, and the 9-hole lane of Javea Club de Golf. From March to mid-October the beach towards las Marinas is ideal for wind and kite surfing. In Denia one can go sailing, rowing, canoeing, diving, water skiing, sports fishing, yet skiing, and much more all year long. The harbour and marina also offer all the facilities and equipment for sailing and fishing trips. Cova Tallada, close to Denia , is a protected nature reserve with many rocks, caves, and sheltered inlets. It is a beautiful place to go scuba diving. There is a diving school in Denia which facilitates trips to this area. Besides bike and hike tours in the nature reserve of Monte Montgó, the area is also very suitable for horseback riding. You can also enjoy yourself with tennis, squash, paddle, and fitness centres with, amongst others, spinning, taekwondo, aerobics, judo, and power plate facilities. From Denia you can travel to Alicante or Valencia by train. Get on the train in the centre of Denia and follow the scenic tourist route along the coast and the mountains with beautiful views. Unless you are in a rush to catch a plane, it is great fun to admire the coast or to go shopping in another city. Or get on the Limón Express at Gata de Gorgos. This too will give you a wonderful excursion. A train from the good old days takes you along the Mediterranean Costa Blanca in a trip of a few hours. The train travels up and down daily from Gata de Gorgos and Benidorm, and takes you past Altea, Penon d'Ifach, Teulada and other nice places. Located in the centre, you have all facilities such as shops and restaurants at walking distance. The harbour is directly in front of you and you are very near the first beaches of Las Marinas and Las Rotas. This is the northern part of Denia where most of the sand beaches are located. An excellent tourist area with beach stretching approximately 14 kilometres. The southern area of Denia housing some sand beaches and multiple rock beaches and bays. The total length of these beaches is 4 kilometres. The holiday houses, holiday villas and holiday apartments in Las Rotas are situated in calm suburbs. The holiday rental houses, holiday rental villas, and holiday rental apartments on the slope of mount Montgó , outside the nature reserve, are mostly located in calm suburbs. District villages such as La Jara, Jesús Pobre, and La Pedrera are all picturesque towns.